Shazam! learns to fly like Superman in the latest TV spot. It's only been a few days since the release of the second trailer for the highly anticipated superhero movie, but we now have a brief TV spot that features some brand-new footage paired with mostly recycled scenes from the first two trailers. As with just about everything that we have seen from the movie, this new look is a lot of fun and reiterates that Shazam! isn't going to be a normal comic book movie. As it turns out, belief is the key to superpowers. Well, at least in six out of ten cases, according to the new Shazam! TV spot. The hero-in-training appears to have been dropped from a plane and is trying to figure out how to fly like Superman as he starts to panic and figure out what arm to lead with. 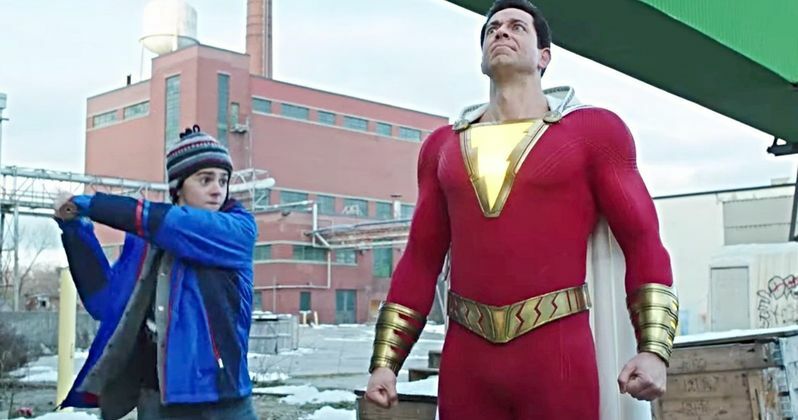 When a 15-year old is just coming to grips with gaining adult superpowers, this is to be expected and it's pretty funny to watch Zachary Levi figure it all out. In the previous Shazam! full trailer, we see our hero try to leap a building in a single bound, only to fly directly into the building, which leads to some broken glass and screams. There is going to be a lot of trial and error for the new hero as he starts to figure things out for himself and that is going to be a fun part of the journey to witness on the big screen. When director David F. Sandberg and Zachary Levi first started talking about the movie, well before production had begun, they compared the movie to Tom Hanks' 80s classic Big. That spirit looms large in all of the promotional material that has been released so far. Back in 2017, Zachary Levi said that Shazam! was going to be like Big, but with superpowers. While that seemed like a weird comparison to most, it felt perfect to fans of the DC Comics source material and it's starting to become evident to those who aren't familiar with the comics. The movie is starting to look like a perfect family superhero movie with a lighthearted touch, which should be a big draw at the box office upon its release in about a month. Shazam! hits theaters on April 5th, which is right in the middle of Captain Marvel and Avengers: Endgame's releases. That is a prime spot to be in for the movie, especially since it has a completely different tone than the two Marvel Cinematic Universe projects that are on the way. It should give the movie some time to have its own shot at dominating the box office for a few weeks before Endgame drops and starts to break box office records. You can check out the latest Shazam! TV spot below, thanks to the Furious Trailer YouTube channel.